Formerly the diary of a heart broken gal wandering the streets of Paris after a broken engagement, Tales from the Chambre de Bonne continues to follow the "Blog Opera" of a brazen Italian-New Yorker trying to find her way home in the City of Light. 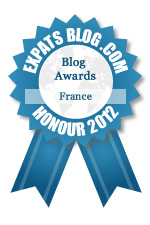 ExpatsBlog.com Expat Blog Awards 2012: France Honourable Mention Award! When I first stumbled across this blog I read it start to finish and have been following along ever since! I love Miss Coquine's honesty and knack for storytelling - a characteristic a lot of blogs lack these days - reading her blog is like reading an email from a friend on the other side of the world! When I found this blog, I was immediately intrigued. I started reading from Ella's first post and read all the way through like a novel! I just find Ella so honest and funny, I love to read about her adventures in love and in France. I've never met her, but I feel like I've gotten to know her through her blog. I'm inspired by her courage to follow a dream and relocate to another country, and also for sticking it out through some painful experiences in the first years. I'm happy that she's found her footing in a different culture, and that she's now engaged to a wonderful Frenchman! I'm excited to see what else she gets up to and how things all turn out for her. This is a wonderful, fun, engaging blog! This blog is real, honest, and funny ! If you want a dramatic insight on the life of a simple girl in the city of lights, YOU MUST CHECK THIS OUT! There is so much to go on, you will always find something to relate too which is a very human aspect to Ella's story. And.... so much crap happens to her ! I have been following Ella's blog for well over a year, and to this day eagerly await her near-daily entries which perfectly capture la vie quotidienne in Paris. Her life is the perfect, easily digestible melange of flash, fun and genuine humbleness that always has me coming back for more. Great blog ! This girl is funny, and even though I'm a guy, I actually really enjoyed it ! My girlfriend told me about it because she related to some of the posts. So I got to reading it and was surprised at how real and smart Ella was ! I think anyone could find this blog either entertaining or even helpful. TFCB is one of my favorite expats in Paris blogs! It's honest, funny, and for once the blogger isn't painting her life in France to be a Marie Antoinette fairytale!!! This girl keeps in real. Congratulations Mlle. Coquine! You deserve this! Great blog, and a daily haunt for me. It's the dream for many Americans to drop everything and move to a romantic, euro city, and it's refreshing to read Ella's cheeky, sarcastic, but most of all, earnest takes on her daily life. Plus, her mom is hilarious. This blog always brightens my day.....so fun and so real! Be careful, though......it IS addictive and you will want to go back and read old posts to get caught up and will have a hard time prying yourself away from your laptop! Which female blogger can say "I have non-blogger straight males reading my blog!"? well, she can. Her blog appeals to a way bigger audience than just francophile women who want to live in Paris. Unlike most blogs, it's objectively hilarious and she does have a writing style. I love, love, love this blog. I started reading over a year ago and have been following it religiously ever since. There are so few people who can find the humor in the most miserable situations. Ella is uplifting, positive, bright, and hilarious and always puts a smile on my face, no matter what kind of day I've had. As a French, I love reading Ella's blog because her outlook on life in Paris is sharp and observant. She makes me realize many things about my own culture and my own people, and she makes me love the American culture through keen remarks about everyday life. Plus, this is a very funny blog! I am obsessed with this blog. Ella is so funny and charming. You can always get a good giggle from this witty, quirky gal. J'adore Ella!!! My daily dose of fun comes courtesy of Miss Ella Coquine. I just love how she can turn any bad day into a huge laugh. She will make any American gal want to live in Paris. As someone who is moving to Paris in the upcoming year, this blog is exactly what I need in terms of information with a comedic twist. Ella is a gem and only after a few weeks of following her adventures I'm completely hooked! I'm so proud that Ella is being included in this. I often think her blog is over looked because of how different her spin is on Parisian expat living. No matter how kooky and off beat she is, two facts remain. She is an expat living in France and has a fantastic blog! I love this blog! Ella is a wonderful writer and just knows what to say to make it so relatable. I've never met her (hope to some day!) but feel like I know what she's going thru with the way she writes her adventures. TFCB is a daily read for me and I highly suggest you bookmark it too. I'm a new reader to her blog but I couldn't "put it down" once I started, it does read like a novel. Wonderful, well-written, real, honest, funny, sad...Ella has a little of everything in her Parisian life! I absolutely love it, and the fact that she interacts with her readers is very cool too! I'm new to her blog but I can see and feel how her followers have come to care for her as a friend and almost a family member. Love, love, love Ms. Ella's blog. I particularly enjoy her genuine and honest insights to Parisian life and how much of herself she shares with her readers. I always look forward to her posts because I know she will not disappoint. Enchanting...bright, articulate, funny, witty, unexpected charm. Each Parisian corner turned shows a new depth to this exciting writer. She shares all...and exposes her wounds...briefly tends them...gets up...brushes off her knees...and begins again. When reading...I wonder...am I intruding? But she entices and beckons readers to read on...and advance to the next adventure. Ella's tales of heartbreak and new love tell every girl's tale - but with so much humor, wit and compassion that you can't help but cheer her on. Add in a Paris backdrop, and this has become one of my must read blogs. I've loved following her adventure and living vicariously through her, and as a fellow New Yorker it makes it feel just a little more real. I love escaping to Ella's world for a little bit each day, but it's her honesty and humor that keep me coming back. Ella was added to my "favorites" since the day I first came across the blog. I turn my computer on every morning and immediately check in to see what Ella had encountered that day. Her sense of humor literally has me laughing out loud. Her amazing, glamorous but sometimes challenging life in Paris will have you addicted from your first read and have you begging for more. She needs to write a novel! I smell NYT best seller! Ella's witty, sassy and inspiring blog is more like a novel, but better, as it is constantly being updated! I can honestly say that TFCB is my favorite read online, hands down, and I've been a loyal reader for over a year now. She even inspired me to visit Paris and walk down the same blocks and visit the same establishments she so eloquently describes in her stories! It is hard to put the genius that is her blog, the lushness of her narrative, into words -- just go and see for yourself! You will instantly subscribe yourself to her colorful, Parisian life and will be laughing within seconds! ...And as a plus, she so kindly responds to her commenters! I'm addicted to TFCB! I've always wanted to visit Paris and now more than ever!! Miss. Coquine has me living vicariously through her blog! I am captivated with with each new post! Ella is witty, smart and oh la la fabulous! I love it! Hilarious , informative and true to Paris life.. Ella is a very deserving writer for the Expat Top Blog Award!! J'adore Ella! She's effortlessly witty, fun and cool. But cool in a "I'd love to hang out with her" way, not cool in a "she'd probably talk about you behind your back and put cigarettes out on your dog" way. Full of fabulous stories, not afraid to put herself out there & always interacts with her commenters, which I love. Definitely deserves all these rave reviews and more! Where do I start? This blog is a gem in the vast desert of expats in Paris blogs. Much like the author, it's real, not trying to be something/one it's not and without question hysterical. After 3 years in Paris, she has managed to jump over the hurdle of Parisian cliches and has gotten to the root of this city all to learn that it's not always pretty. After everything she has experienced (getting dumped, robbed, having friends and her own family turn her back on her), it's a marvel that the girl still manages to find the humour in life! She's an inspiration to women. This blog deserves more than 5 stars! Coming from Reno, logging on every morning to get a glimpse into not only a life in Paris but an interesting one to boot! This girl is tough, funny, smart and most importantly sincere. She captures her readers and responds to comments as if she's talking with people she actually knows in person. Her big heart, dry wit and observations on life is what keeps us all coming. Good luck! For someone who reads many Paris blogs, this is the only one that I have seen over the years that has attracted such a cult following. It's been an incredible evolution to watch. She captivates her readers with her humor, good nature, and amazing life stories and experiences! Us readers are so proud of her and we've never even met her! It's only been recent that we've seen what she actually looks like! That's how powerful her writing is. To a new reader, if you want to read an original take on the Paris blog, I urge you to read this one. You will not be disappointed. Ella Coquine is an extremely gifted, funny and honest writer whose tales about life in Paris range from hilarious to heartbreaking. I've been reading "Tales from the Chambre de Bonne" since the very beginning and sincerely hope that Ella will turn her talents to writing a novel that some clever producer will make into a movie. The question is - which movie star is enough of a "coquine" to play Mlle Ella Coquine?! What a lovely way to perk me up on this gloomy Friday afternoon. I had no idea that TFCB was being nominated for an award! She's so secretive (modest?)! If there is anyone who puts in hard work and time to keep us all entertained with her thoughts, experiences and observations on life in Paris, it's this girl! A well deserved nomination! Good on you Expat Blog for recognizing talent going beyond where to get the best croissant in the city! I'm warning you: reading Tales from the Chambre de Bonne is dangerous. One minute you're reading the latest post, and next thing you know it's two hours later and you've read a dozen more and can't stop! I agree that this blog is destined to become a book at some point. Find a comfortable seat and get ready to get lost in Ella's writing. Ella will quickly become one of your favorite bloggers--of the "what did I do before her?" --not to mention the top of " to open immediately on a bad day" list. She is funny, warm, charming, sincere and tells it like she sees it while avoiding the cheesiness--not an easy feat in France! Go, Ella! Once I found Ella's blog I spent an entire day at work reading it from the beginning..having to click back and forth from her pink page to my "work" ..but it was so worth it...she has a great heart..is funny and honest. Her commentors are as much fun as her blog...a real community. A must read daily! This is an excellent blog about real Paris living! I studied abroad in Paris for my Sophomore and all of over observations are on point. Reading La Coquine brings me back to my college days! I particularly like her hilarious self-deprecating take on expat living, how she stays true to her roots and her ability to jump over some of life's toughest hurdles. This is a well-deserved nomination! I wish her good luck. This is Paris in the eyes of a New Yorker. A must-read for all who want to know what really happens on the streets of this city. She's tough, funny, warm and has a great sense of the city. I wish her all of the best! I have known Ella since she was a wee lass. She's one of the most hilarious, outrageous gals I've ever met, and her blog shows it. I'm not even one to read blogs very often, but I definitely got some good laughs in here. Can't wait for the book! I love this blog! Each post is its own well-constructed story. It's so informative about French culture and the expatriate experience. I really enjoy reading Ella's blog. She writes with such honesty and wit. It's so addictive that it is impossible not to come back every day in search of a new post. You can't help but root for her. A wonderful read. This blog is one of the few blogs that I actually have time to read. It's honest, funny and invites readers to see what it's like to live in Paris for the average working person living on a budget. She brings that New York edge to the City of Lights and I think that's why she has such a big following. I can't wait to see her House Hunter's episode next week! J'adore Ella. She rocks and deserves this award! I look forward to her daily posts like a kid looks forward to Christmas! I absolutely adore Ella! She is without a doubt one of my favorite bloggers, not just in France, but in general. Nobody is a fabulous as her and her posts never disappoint. A must read for an honest and quirky look at Paris and the French. Love this blog,I spend time reading it when I am supposed to be working!It puts a smile on my face and often makes me laugh out loud. Ditto to all of the other commenters. I've had the pleasure of reading the misadventures of Mademoiselle Ella for the last year and I always wait to read it with my morning coffee, so that I can take it all in and appreciate the view into a fellow curly haired girl navigating France. Definitely one of my must-reads.